These images are ones shot to post in the daily community on smugmug. I've been participating in this community for about six years. For the first few years, I tried to always post a shot taken either that day or the day before. Now, although I try to shoot everyday, I don't necessarily post the images on the same day they are shot. Clearly, this image has had considerable post-processing. I don't even remember all the steps I took to get to this point. I was aiming for a sort of super-HDR effect. I don't know if I like the image or not. Please give me a real critique on this one. What do you like, if anything. What do you dislike. How would you suggest it be improved? Thanks for your help. I like the processing - lots of definition. Excellent work. Love the scene captured here work and play, nice colors with the HDR effect, but not over the top I like the fact you kept i real!!! I love this shot - it's like a modern Norman Rockwell painting! I like this Judith. The green grass, yellowish house, red car and blue sky all work well together. And I like the processing. I love all the elements. The people engaged in different activities on a warm spring day (tulips) yet together. I would have liked to see the tops of the roof that were cut off but over all a very successful photo. Most HDRs look way too over-processed, but this one, even though it has the HDR look, it is quite good. My favorite part is the physical action on the lawn and the car detail in the background. 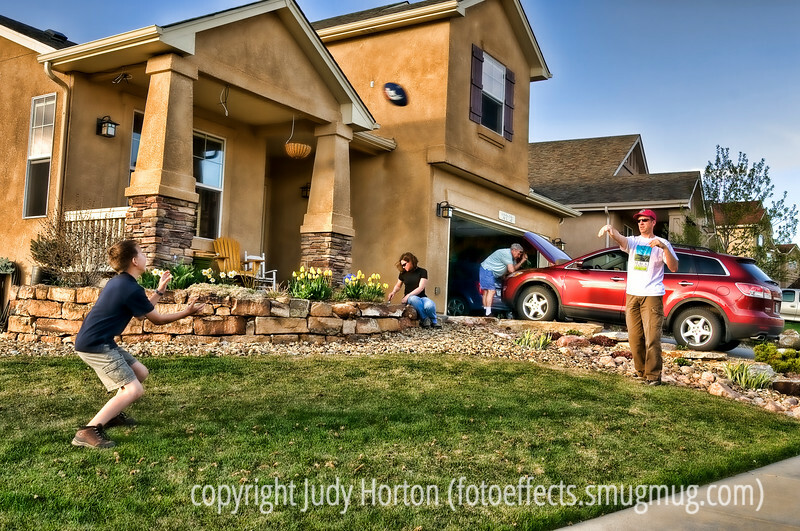 I do like this shot, great pp, I like the way you have captured the guys playing some ball game in the garden. Great photo,i love hdr effects especially story book looks and cartoony style,i love it. Judy, I just want to repeat my sentiments, that this image here is by far one of the best story tellings pictures that I have seen in Smugmug. Outstanding! I want to start by saying my comments are meant in the spirit of community, all of us helping each other get better. I really enjoy your work, I like that you explore so much. The HDR/color effects on this shot are beautiful. They make an "ordinary snapshot"(when I look at the rest of your work I don’t think you just walked up on this shot) really interesting but I find myself not liking the man & boy in the foreground. I don't know if it's the action interfering with the background or what but it’s like I’m looking at 2 different shots competing with each other. I like the dynamics of the composition (the clipped roof peaks and diagonal sidewalk) I love the color and the gesture of the woman and man in the background but I want to yell at the two playing catch to “get the hell out of there”. How would this shot work if you muted the background and highlighted the two in front? It’s so easy to be misunderstood in email form, am I making sense?